Boston Loves Paris: Let it Snow, Let it Snow, Let it Snow! This morning, Angela woke up at 6:00. She made coffee, and watched the news, just like every morning before she goes to work. This morning was different. 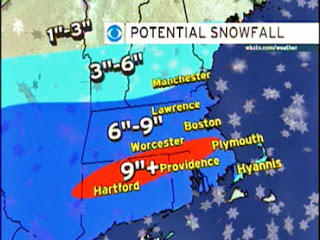 On the news, the weatherman was talking about a HUGE snowstorm that would hit Boston by lunch! 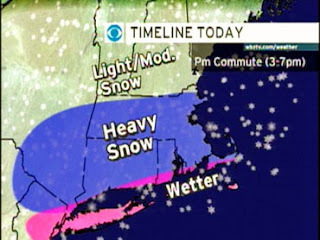 Snowfall could total 6 to 9 inches (15.2 - 22.9 cm) in Boston. They said that the snow would fall the fastest and hardest early afternoon. 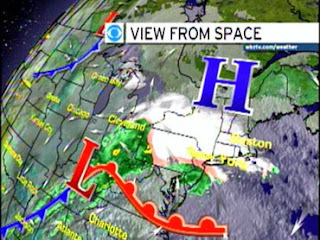 This is a satellite view of the big storm approaching Boston. Angela went to work as usual this morning, but she told Guillaume before she left that she would be home early, because she did not want to get stuck in what was sure to be a nightmare on the roads. She went to work for 4 hours. After her meeting ended at 12:00, she jumped in her car before the first snowflake hit the ground. On the drive home, she noticed that there were a few snow sprinkles. By the time she got to her exit at the Charles St. T Station, the flakes were flying! She was disappointed that the parking spot in front of their home was taken, but there was another parking spot just up the street. Guillaume helped her carry her packages upstairs, and she was comfortable and safe at home! These pictures are taken at around 1:30 p.m., shortly after Angela got home. In this one, you can see little snowflakes in the air, and the ground barely has a dusting of white. Here, you can see a light covering on this black Saab. Just 15-20 minutes later, look at the difference already! Here is the same black Saab. And the same black Saab. Are you sick of the Saab yet? Because there's more. In Beacon Hill, because the streets are so narrow, we don't get the big snow plows to clear the street. So instead, they use tiny plows like this one (next to the black Saab). And then, this little snow plow got stuck. And couldn't move. So they called another plow, this one a little bigger, to help the little plow. Finally, he was okay. So, here again, same street corner, about 30 minutes later. You can see the snow really piling up! And of course, the black Saab. What happened to the Saab? There's just an empty parking space where the Saab used to be. Sadly, Guillaume had to go to work in the middle of this fun. So he bundled up in his new North Face winter coat, his hat, scarf and gloves. And he went outside and braved the fierce storm! He took a picture of Angela from downstairs. Can you see tiny Angela up in the window? He took some pictures of the neighborhood before he left. This is looking up Garden St. Angela's car is in the front on the left (the person who was parked there moved, so they ran downstairs to move the car into the good spot). This picture was taken at the intersection where they live. This picture is looking down Garden St. towards Cambridge St.
And this is Angela's snow-covered car that she will have to clean off on Friday morning before she goes to work. She might treat herself to a latte from Starbucks after that. Guillaume called Angela and told her that he made it to work safely. He walked to work. Of course he couldn't ride his bike, and if he took a taxi, he would not have made it in time! On his way home, he stopped at the video game shop for a treat. Then he stopped at a shoe store and bought some winter boots. Then he stopped at Savenor's for some fresh bread, so we can have some cheese and bread for dinner! Hooray! When he got home, he took some more pictures of the neighborhood. Here is Angela's car, really covered in snow! He walked down to Cambridge Street to take pictures there too. Here is the famous Holiday Inn. And then, Guillaume changed into something a little more comfortable (the couch! ), and I think you can all guess what is in his hand! Angela & Guillaume are safe and warm, and very happy to be home together on this first snowy night in Boston. New Englanders are having their Savenor's trés tardif, ce soir. Wahou !! It's amazing to see Boston like that ! Good work boys and girls ! Here , each day is warmer ! Did you see our most recent fat fatty (the little snow plow)?! Oh, enjoy the warm. I am jealous! Wouaouh...it's not the same Boston we know..it's nice, but just when we have nothing to do...only watching on tv, reading, playing video game or eating, drinking and sleeping.. Here, every thing is ok..we will be happy to see you in a few time..
Agreable denouement--Guillaume revient a sa maison de bonne heure.